"This takes Sierra Leone into the big league for solar energy for rural electrification," the Ministry of Energy said on its website. The ministry is also planning on launching a National Renewable Energy Program later this year in Sierra Leone. 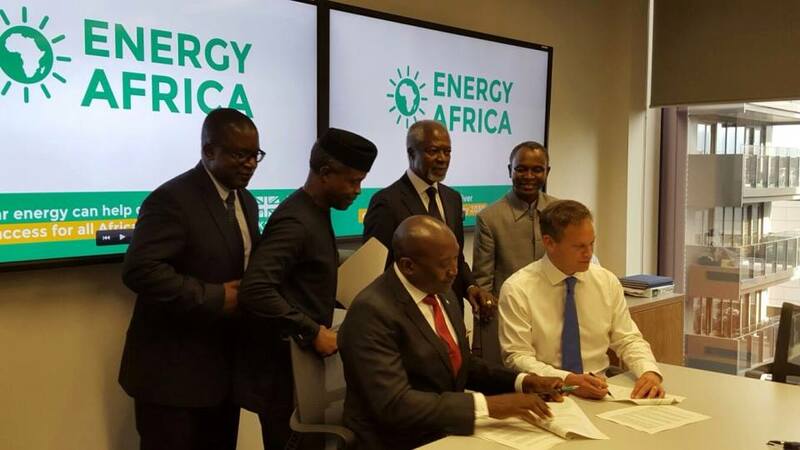 The Energy Africa event in London also saw Nigeria signing a similar agreement. In attendance were the vice president of Nigeria, Yemi Osibanjo, who signed the Nigerian agreement, the governor of Kaduna State in Nigeria, Mallam Nasiru el Rufai, and former UN secretary general Kofi Annan. 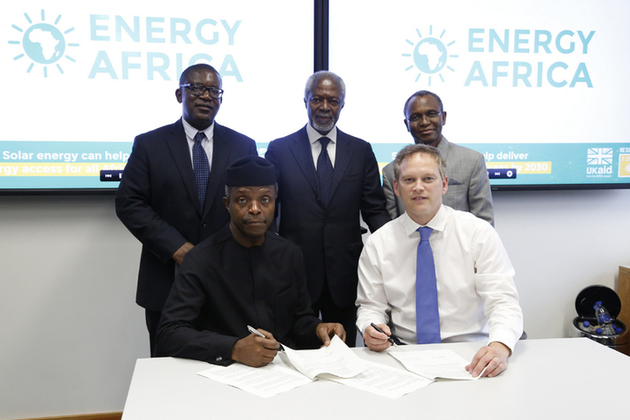 Annan – as well as a number of politicians and business leaders – attended the launch, with former UN secretary general Annan calling the current energy imbalance – which sees some of the world’s poorest people pay the highest rates for power – "intolerable, avoidable and profoundly unfair". Below is a speech by U.K. development minister at the launch of Britain's #EnergyAfrica campaign, held at Facebook UK's headquarters in London. Now, we have all just signed up to a Global Goal which says everyone should have energy access by 2030 –15 years' away. From hydro to wind; geothermal to gas. There are any number of ways to solve Africa's energy crisis. And of course, expanding the grid will be key. But whilst only a few can access and control Africa's rich energy wealth, the sun belongs to us all – and it is in greater abundance on that continent than perhaps any other. Moreover – all serious projections for meeting Africa's energy needs recognize that the grid will only ever be able to meet 40% of that need. So we have to look elsewhere too. - And appliances demanded too much energy. - And appliances like LED lights, but also TVs and fridges are much more energy efficient. Just as relevant though is the spread of mobile phones and the development of mobile money – like the remarkable British inspired M-PESA payment system, popularized in countries like Kenya and Tanzania. I was visiting the home of a 62 year-old women called Elizabeth Mukwimba who lives in Mwanza region – a 16 hour drive from the capital, Dar es Salaam. This has transformed Elizabeth's life, but don't take my word for it, please watch her video. Getting electricity at home through a solar system has transformed Elizabeth's life. And it will transform others. - And when they're sick, it means not having to light a candle or burn kerosene to check they're ok.
That's the big difference with Energy Africa. But I think this focus is wrong. All this talk means nothing if there's little chance of the grid ever being connected to your remote home. DFID maybe a super-power in terms of its development spend and commitment to 0.7% but, Energy Africa isn't about spending millions; rather it's about getting commercial markets to actually work, and to work particularly to benefit the world's poorest consumers. So we'll partner with African governments to programme in detail and to tear down legislative, policy and bureaucratic barriers that stifle the household solar market. The kind of things which block mobile-money payments, impose restrictive duties on solar, whilst subsidizing dangerous Kerosene. We'll also work closely with other donors and organizations – like SE4ALL and Power Africa – to provide the technical support and knowhow needed to make those reforms happen. Finally, we'll bring investors together with solar energy companies – highlighting the massive opportunity; helping finance to flow and businesses to grow. And that work starts today. Right after this event, I'll sign partnership agreements with Nigeria and Sierra Leone – which set out our commitment. With a dozen more of these national agreements to follow. But to deliver, we all need to work together: as countries, as organizations, as people. That's why I'm so pleased that you are all here today – and in particular I'm grateful to Madam Zuma, Vice President Osinbajo, Mr. Kofi Annan and Mr. Bob Geldof for shifting incredibly busy schedules to make today's event and for using their considerable influence to bring this issue to the world's attention.